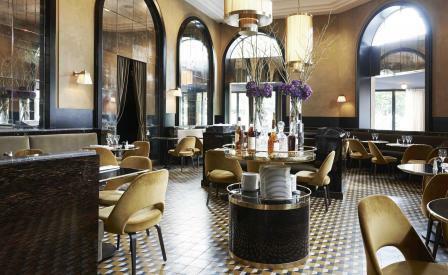 A Parisian institution of sorts, Le Flandrin has occupied a former railway station – a Beaux-Arts structure dating from 1854 – in the affluent 16th arrondissement for over 80 years, serving classic French fare to the area’s well-groomed patrons. Owned by the Malafosse family, the brasserie - currently under the direction of Gilles Malafosse - has recently emerged from a makeover that has upgraded the interiors and transformed the dining room into a sleek new meeting place. Following the success of Monsieur Bleu, his restaurant in the city’s storied Palais de Tokyo, Malafaosse once again enlisted the skills of interior architect Joseph Dirand, who maintained his signature understated aesthetic, while blending in a hint of decadence with texturally rich materials such as marbles, dark woods, brass, mirrored glass and plush upholstery in mustard yellows and khaki. Meanwhile, geometric-patterned flooring visually offsets Dirand’s palmwood tables, which are teamed with Eero Saarinen’s ‘Executive’ chairs for Knoll Studio.